The London International Youth Science Forum 2015 is currently hosting a record number of participants from 65 countries. One of the flagship programmes at the forum is the Science Forum Bazaar. In this series, we spoke to students about their projects and will be showcasing some of them in our blogs. Building a battery using bleach? Amine Bouchari and Davide Rovelli, Italy, developed several prototypes for a battery that is environmentally friendly and cost-efficient in the hopes that no individual will ever be without battery power. Amine designed a battery that uses bleach as its catalyst, rather then heavy metals like most batteries. By using bleach as a catalyst, when the batteries are disposed of, instead of releasing heavy metals into the environment, the bleach decomposes into sodium chloride, which is not harmful to the environment. The current prototypes reach 1.6 volts, which is the equivalent of an AA battery. The team’s research also indicates that the batteries can be either non-rechargeable or rechargeable, which implies that it could be a suitable alternative for computer and phone batteries as well as disposable general use batteries. You can watch a video with more insights on batteries and bleach here! Chelsea Herbert, UK, studied the affect of the WT/Cre mutation in human intestines to understand its causative relationship with colorectal cancer. In a normally functioning body, negative feedback occurs and regulates the number of cells by producing or destroying cells when required. However Chelsea discovered that the mutation causes extra cells to be produced in the intestinal walls, which become cancerous cells. She also noticed that the villi of normal intestines appear long and thin, whereas the villi in a mutated intestine appear to be short, thick and serrated. After discovering these results Chelsea went on to investigate the life cycle of the cells. By using an antibody stain, Chelsea was able to see which cells were replicating. During replication, cancerous cells actually require a short period of time where they are “resting” before they can replicate again. The rest phase is an ideal time to interfere with the cancer and prevent further growth. Chelsea’s current aim is to thoroughly understand the mechanisms of WT/Cre mutation, which could allow her to create simpler tests for colorectal cancer and possible treatments. Oskar Renåker, Lucas Fredriksson and Simon Wigge (Sweden) developed a system for the purpose of teaching the tricarboxylic acid (TCA) cycle (aka Kreb’s cycle) to high school students. The TCA cycle is vastly complicated and difficult to understand, so Oskar decided to find a way to simply the TCA cycle to enable it to be taught to students as early as high school. The more complicated TCA cycle…! Oskar created an enclosed chamber, which contains a black box that detects O2, CO2, light, temperature, humidity, pH and a range of other environmental variables. The chamber can be used for a range of environmental conditions. The environmental data is sent back to a computer and place through visualising software for the students to analyse. The stream of data is continuous, so as conditions within the chamber change, the data within the visualising software changes as well. This actually allows the students to observe the changes occurring due to the TCA cycle, unlike conventional methods of teaching. Interested in seeing other projects at the Bazaar? 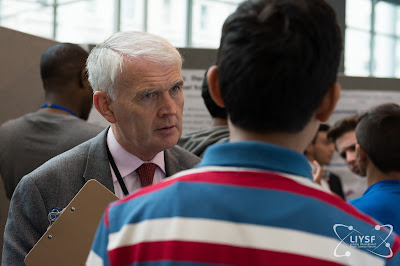 Check out what participants were researching and presenting in 2014 – LIYSF 2014 Bazaar. To find out more about the science forum bazaar and how you can get involved in LIYSF, click here!